Utagawa Kuniyoshi (1797-1861) Stories of Wise Women and Faithful Wives: Hotoke Gozen, 1841. Oban. 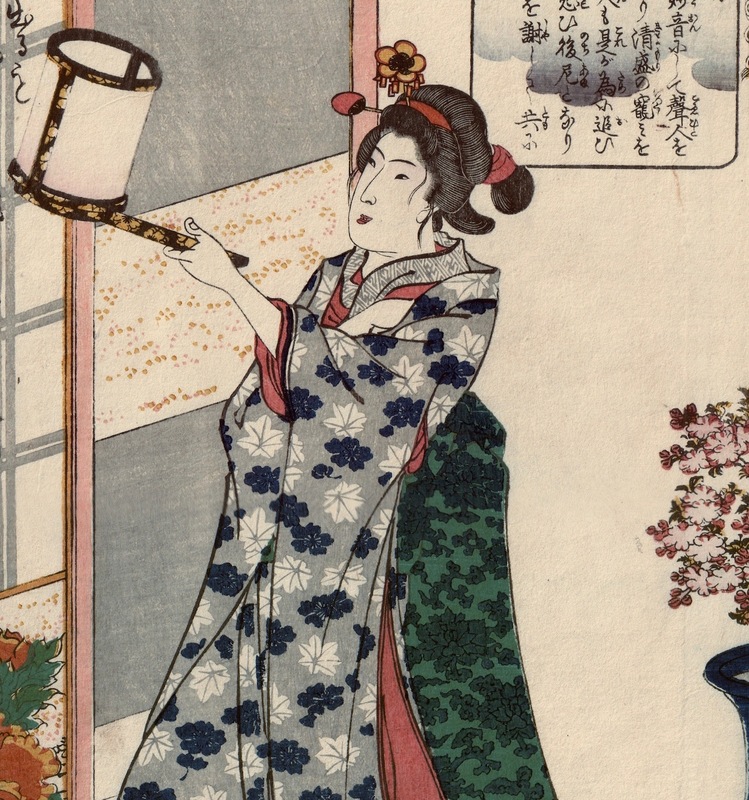 This piece is from a very highly regarded series by Kuniyoshi of thirty-four prints carried out in the early 1840’s. The series is notable as being the first in ukiyo-e and the first in Kuniyoshi’s career to be devoted entirely to strong images of women. Some derive from the traditional Chinese, Confucian texts of self sacrifice and virtue but Kuniyoshi has added to this canon with portraits of women who have resisted male dominated society and exhibited strength and virtue in a far more modern way and in ways that we might today recognise. A revolutionary departure for this series was to present women in non-sexual ways - hitherto women had been drawn with sexual attraction as their primary feature. This was ground-breaking at the time and established a strong tradition, culminating with Yoshitoshi, of showing women as strong independent members of society. The basis for Kuniyoshi’s reappraisal of women was the Confucian texts popular among Edo audiences; these tracts used storytelling as a way to encourage moral behaviour in young women. Strangely and inexplicably, Kuniyoshi alters the sense of these texts, choosing to illustrate women in positions of strength or power or self control… independent and sometimes in opposition to men. The subject here is Hotoke Gozen, a shirabyoshi dancer. 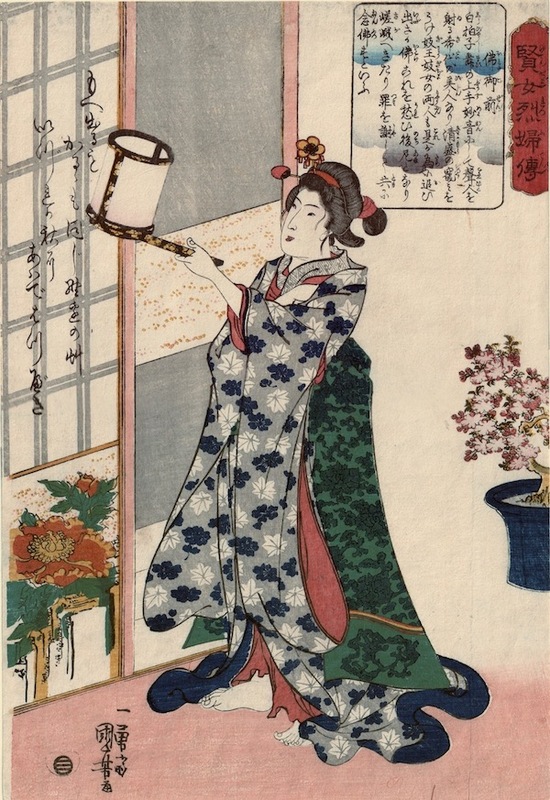 Kuniyoshi pictures her in a scene from the aarchaic story, the Heike Monogatari. The warlord Taira no Kiyomori has a favourite dancer in a girl called Gio. She invites Hotoke Gozen to dance before Kiyomori who becomes entranced by her and dismisses his former favourite. In despair, Gio is sent out into the night whilst Gozen occupies her position. On entering the dancer’s quarters, she sees a poem written by Gio on the shoji screen, lamenting the passing and cruelty of time. Meet with the same hapless fate. Gio was forced to retire against her will, becoming a nun along with her sister and mother in Saga. Later, Hotoke left Kiyomori to join the sisters and become a nun as well. The scene is beautifully pictured on a print by Kiyochika in this selection. This is a great print, and important as a first effort to reimagine women in traditional Edo culture. Kuniyoshi shows Gozen wistfully examining the poem by Gio, which speaks of both her own and Gozen’s fate. Colour, impression and condition are all outstanding. Japanese album paper backing. Slight trimming on the right margin.